There are some flavours that I just can’t get enough of and one of them is coconut curry! What I love about this combination, is the versatility. Change up your curry paste or powder from Thai to Sri Lankan to Indian and you experience a world of flavours. Throw in some apples, mango, or pineapple and the dish morphs into something new and exotic. And almost any protein source is fabulous in a coconut curry: shrimp, chicken, beef, fish, and even tofu all love the combination of coconut and curry! This recipe uses Thai yellow curry paste. I don’t often cook with yellow curry paste, most often opting for the hotter red or green version, but I was so happy when I tasted this dish, that I did a little dance! The more mellow personality of the yellow curry really compliments the softer nature of the butter lettuce. One of the things that I love about this recipe is that you could serve the chicken many different ways. Throw it into a wrap with some rice, lettuce and cucumbers; wrap it in larger lettuce leaves or make it into a very exotic chicken sandwich! I’m sure that I am only scratching the surface of the possibilities. Tonight I am excited to bring a giant platter of this dish over to Angie’s Fiesta Friday because I’m pretty sure the gang will appreciate my favourite flavour combination. If you haven’t yet visited the hottest blog party in the blogosphere, I implore you to do so! Every Friday, we race over to Angie’s to mingle and share our favourite recipes, music, photos, poetry or whatever we please. Once you have visited, there is no turning back!! Tonight we have the good fortune to have two very gracious, and talented bloggers as co-hosts. Let’s give a round of applause for Sylvia a@ Superfoodista and Margy @ La Petit Casserole! I found this recipe in Taste Magazine. Again, I am unsure of the date, as I ripped it out of the magazine long before I dreamed I would ever have a blog. Bruise lemongrass by hitting it with the dull side of a knife, then mince very finely. Heat coconut oil in a large sauté pan, over medium-high heat. Add shallots and garlic and sauté just until fragrant, about I minute. Add lemongrass, curry paste and coconut milk and cook for 2 minutes to allow flavours to mingle. Add the chicken and cook until the chicken is tender and the sauce has thickened, about 10 minutes. If the sauce gets too thick, add a little water to thin it out. Remove from the heat and season to taste with salt and freshly ground black pepper. Stir in the coconut and cilantro. 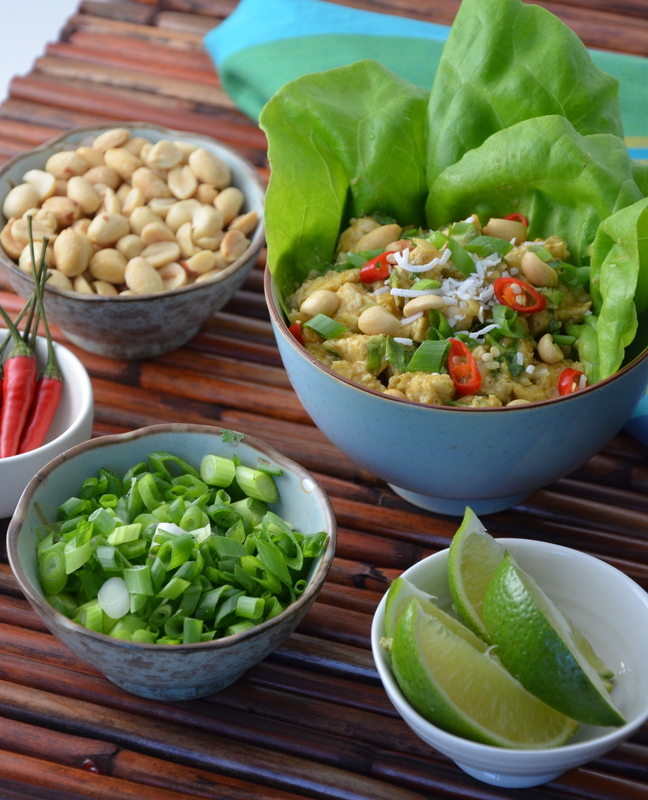 To serve, divide the chicken among the lettuce leaves and sprinkle with green onion, peanuts, and sliced chili, if using. Serve with lime wedges and do a little dance! I looove Thai curry. And your version looks so delicious. But I have never had curry in a lettuce wrap before. I’ll have to give it a try soon. Another recipe to go onto my increasingly long list of recipes to try. Thanks for sharing at Fiesta Friday! Happy 4th of July! It’s really fresh in the lettuce cup. I hope you get a chance to try it, Justine! I love lettuce cup dishes with any filling! Never seen with a coconut curry, but thank you for bringing!!! Ooooo all my favorite flavors, thanks for this treat! 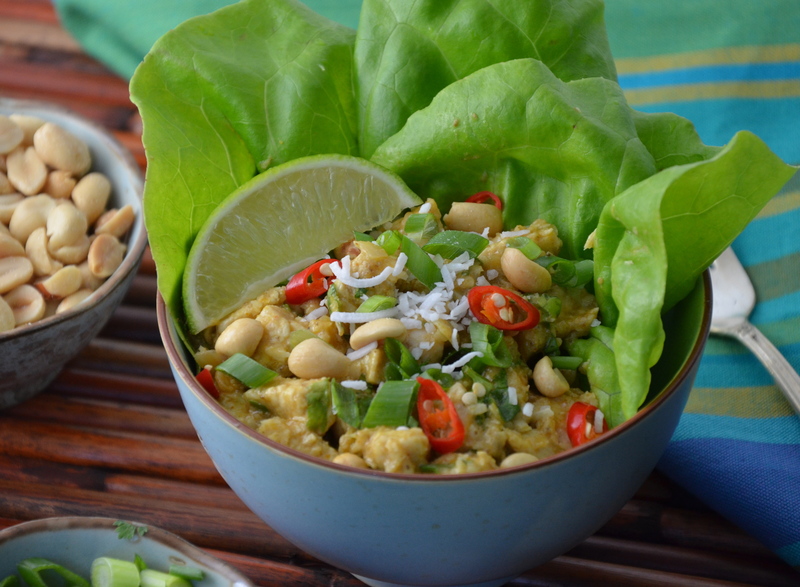 Love chicken curry and really love putting it in a lettuce cup. Light and healthful, so delicious too! I agree. I just had another really spicy one in a restaurant last night and I found that the lettuce really cuts the heat. It was nice! I can only imagine how flavorful and mouthwatering fragrance this dish has. Fusion of all these ingredients with nutty crunches in every bite. Yum! I love a good yellow chicken curry Julianna and this one to be wrapped up in lettuce leaves sounds really wonderful! Julianna it looks amazing and I’m it’s sure super tasty with coconut flavour ! I love the lettuce cups, thanks for bringing this to FF! My pleasure Margy. I hope everyone likes it as much as I do! Thanks Linda! I was hoping they would be a nice addition to the FF feast! This looks like a bowl of deliciousness, Julianna! I can only imagine how fabulous this would taste with the coconut,lemongrass and the peanuts! Yummy and crunchy! Very good idea, Chef Julianna! Happy 4th of JULY & Happy Fiesta Friday! Happy Fiesta Friday to you too, Nino! And of course, July 4th! Sounds very appetizing, I have not had this dish …looks like I better hurry and get in line. 😉 Happy 4th weekend Chef Julianna!! Well, just step up to the table, Naina and grab a big bowl. So glad you like it! Hey Petra! Thanks so much. You and I definitely have very similar taste, don’t you think? Happy FF to you! This looks so refreshing and healthy…. Love the coconut curry chicken. I like the idea of using lettuce leaves to serve. I totally agree that once you visit fiesta friday you are hooked:)! Gorgeous styling on these photos Chef Julianna! I loooove curry too, and especially its versatility! 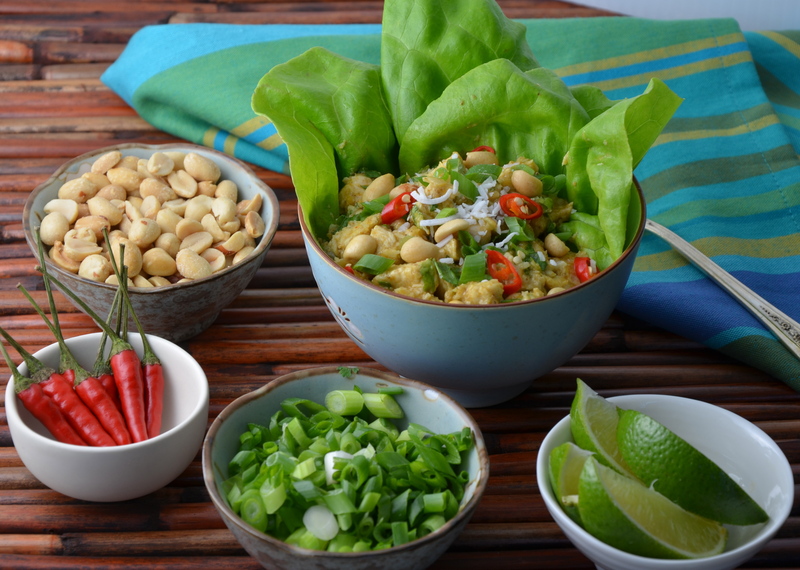 I really like your idea of curry in lettuce wraps! Thanks for sharing! Haha im right there with you! The presentation and photos are awesome. I love the recipe as well. Thanks for sharing!